LIC Plan Presentation Software – Free Download. LIC Plan Presenter from InsuranceFunda is an excel based plan presentation software which can help you to get a clear idea of all popular plans from LIC. It can help to compare all the benefits of plans such as insurance coverage, tax benefits, loan availability, maturity benefits etc. This software is completely free and does not contain any adware in it. You can convert the created presentations to pdf format and send it to your clients also. Please note that this software is designed for Windows desktop with Microsoft Excel installed in it. Plan Presentation Software – Steps involved in installation and usage. LIC Plan Presentation Software – How to enable macros? LIC Plan Presentation Software – How to use it? Download the plan presentation software by clicking the button given below. Save it to a convenient location of your system (Preferably Desktop itself). Save it at an appropriate place. Click on the ‘Home’ button to return to the ‘Quotation Details’ page. You will have to enable macros in your Excel application to use this software. Enable macros from the ‘Options’ button at the security tab as shown in the figure given below. You will be prompted to enable macros in the next child window as shown in the figure given below. If you want more help on enabling macros, it is available in the lower portion of the software itself. Click the link to open the tutorial. Open the downloaded software and enable the macros as shown above. Click on the ‘PlanCalculatorr’ button to go the ‘quotations data entry’ screen. In the quotations data entry screen you can select the plan and give the plan parameters as age, sum assured etc to create plan presentation. Click on the blue circular arrow button the open presentation to create presentations. Look at the sample presentation given below to understand how the created reports will look like. You can easily export the created presentations to PDF using a special button provided in the right side of the reports. If you are using microsoft excel 2010 you can readily use this button to convert presentations to PDF. If you are using a lower excel version, you will have to install a small add-in software from Microsoft called ‘Microsoft Save as PDF’ add-in to enable this functionality on the software. You can directly download the software from Microsoft site by clicking here. 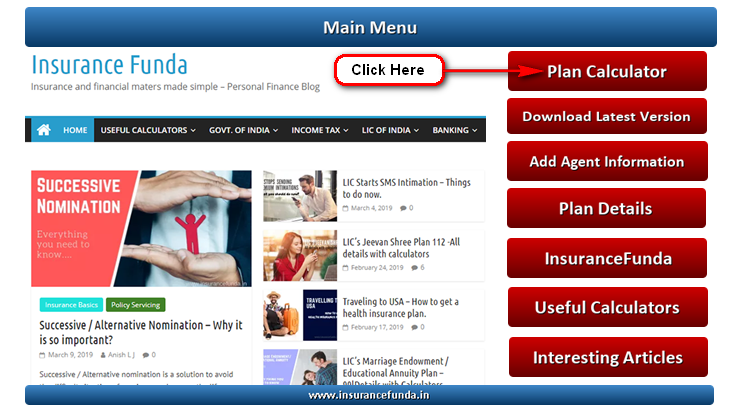 Alternatively you can download ‘Microsoft Save as PDF add-in’ from InsuranceFunda link also. Download and unzip the folder and install the software. Now you are ready to export your presentations to PDFs. Comparison of the features of LIC Policies – Drag and drop tool. Please use the software and notify me of any mistakes or suggestions. I am planning to add more functionalities to this software in the future. So check back and update the software periodically. Please use the comment section given below to give your suggestions. ← Successive / Alternative Nomination – Why it is so important?